18 pp. Roman, 402 pp. There has been a tendency in Kiswahili, Bantu and general linguistic studies to use the term pronoun in the same sense it is used in Indo-European studies. In doing so, the peculiarities of Kiswahili pronouns have often been overlooked in favor of Indo-European grammatical descriptions about pronouns. In recent years, the status of pronouns in Bantu has received some new attention because of the revival of the term incorporated pronoun in modern linguistic studies spearheaded by the Lexical Functional Grammar (LFG) framework. Unfortunately, the recent usage of the term incorporated pronoun repeats all the shortcomings found in the works of the pioneers of Bantu grammatical descriptions. Probably in an attempt to make Bantu languages fit the gender system of Indo-European grammars, the systematic dichotomy pronoun vs. non-pronoun has been blurred and confused by Bantuists. As a result many claims about pronominality in Bantu descriptions cannot be verified by reference to the language and, consequently, they lack explanatory relevance for Bantu. The present study challenges the claims of traditional Bantu and corporate linguistic descriptions on the subject of pronoun and pronominality in Bantu languages, specifically Kiswahili Bantu. It stresses that Kiswahili distinguishes between pronoun and pro-noun and their concords and provides historical evidence to illustrate how traditional descriptions arrive at their conclusions about pronouns and pronoun concords in a Bantu language like Kiswahili. 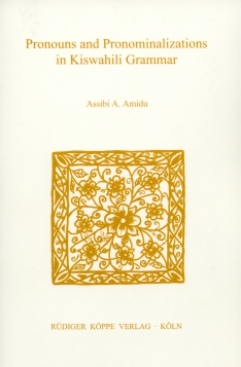 The present work is a road-map for determining in what ways the Kiswahili elements identified as pronouns, pronominal elements and pronominal concords are similar to or different from phenomena in other languages of the world.